Condensation occurs in cold weather when warm humid air cools on contact with cold surfaces like external walls and windows and in places of poor air circulation such as corners, behind wardrobes and cupboards. These are ideal conditions for black mould to grow and will grow rapidly if not addressed. The amount of condensation a home has, depends on the occupant’s lifestyle and the ventilation in place, pets, people and gas fires are all producers of moisture. Condensation is caused by excess moisture in the air, and a lack of property ventilation. The moisture is released from everyday activities, from washing and drying clothes indoors to cooking and bathing, pets and gas heaters. The trapped moisture travels around the home where it condenses onto cool surfaces such as external walls, windows and frames, mirrors and furniture, causing excessive water creating ideal conditions for mould to grow. The mould patches are a visible sign of condensation, and DIYers will know how difficult they are to cover up. 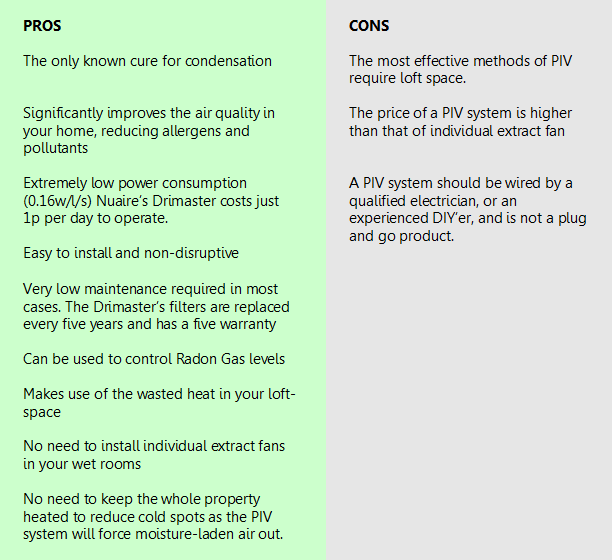 However, the effect on health is the main reason why condensation must be tackled. Condensation leads to the growth of poisonous mould spores. These spores are breathed in by occupants and can cause a range of respiratory and skin problems. The humid environment is also a perfect breeding ground for dustmites, present in the cleanest of homes, to multiply in huge numbers. Another allergenic, dustmite faeces is a trigger for asthmas sufferers and can lead to a range of allergic symptoms. A further consequence of not adequately ventilating your home is the build-up of air-born pollutants, including fumes released from cooking, painting, and using cleaning products, and also the external pollutants that enter the home – traffic fumes, pollen, and in some areas, Radon Gas. Positive Input Ventilation is the only ventilation method that can cure condensation in a property whilst also reducing the pollutants in the air, helping to create a fresh, healthy environment. Most homes will feature some form of ventilation, whether it be extract fans in the bathroom or kitchen, trickle vents in the windows or, normally a feature in older properties, airbricks in the walls. Single room ventilation is effective at reducing moisture levels and cooking odours from individual rooms as long as they are running or if windows and trickle vents are open, but if your property suffers with condensation and you don’t want to lose heat during the winter months then a more robust strategy is needed to force the moisture-laden air out of every room rather than moving it round the home. Click here to find out if damp and mould can affect your health? Its very important to remove black mould as soon as it becomes visible or if you can smell its presence find its location usually behind furniture etc, use a Black mould removal spray, if you find you are unable to keep on top if the issue a more robust measure may be necessary. a. Removal of Black Mould with Kingfisher Black Mould remover. Option 2. Positive Input Ventilation (PIV) This system takes out the humid air and any other pollutants and replaces it with clean filtered air, improving the air condition in your home. Are you a landlord and condensation is a common problem in your properties? Maybe a damp survey would help to resolve ongoing issues?